One of the small branch perches that was attached to the ladder recently rotted and came away from the ladder. As it was still attached at the other end I decided to leave it for now and just pushed it downwards into the soil. Recently the little girls have been obsessed with pecking at it. 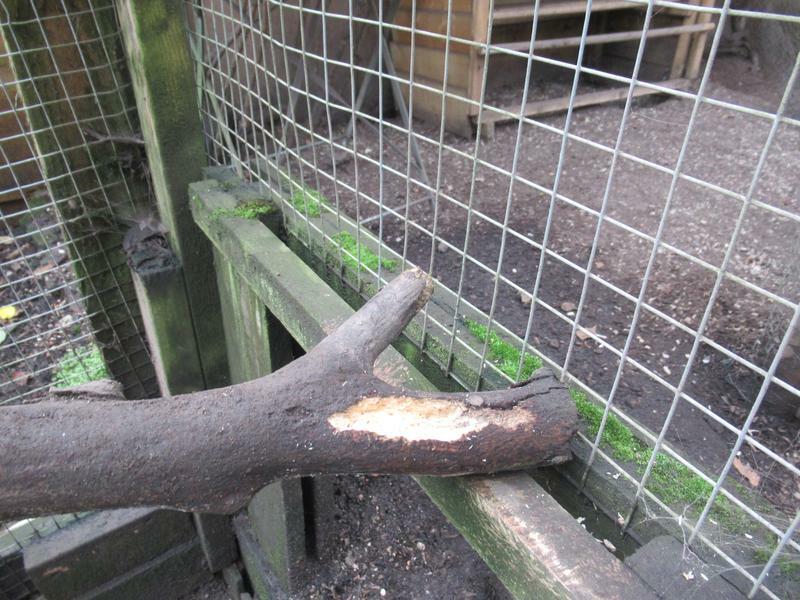 They have stripped some of the fine bark away and have been pecking at the soft wood that I had pushed in to the ground. I then noticed that the bigger branch perch on the other side of the hatch has also been pecked away. Patches of bark have been pecked off along the branch and at the bottom the soft wood has been pecked away. The little girls have been pecking away here too. In the past I had researched chickens eating some pine shavings and it said that it isn’t harmful and aids digestion. Not really sure how that works but I thought that if that is the case then pecking at the wood is probably not going to harm them. However I decided to research this too and found that people had said that their girls do the same thing. One had said that they put a tree stump in the run and the girls had gradually broken it down completely. Some thought stripping bark may be to get at bugs but the branch perches have been in the run for many years and are unlikely to have any bugs. Everyone agreed that as long as the girls had a good diet it was unlikely to do any harm. It seems to me that it is only the soft wood and they will be getting bits the size of dust. All the girls eat well with pellets and greens daily plus apple and corn and other occasional treats. 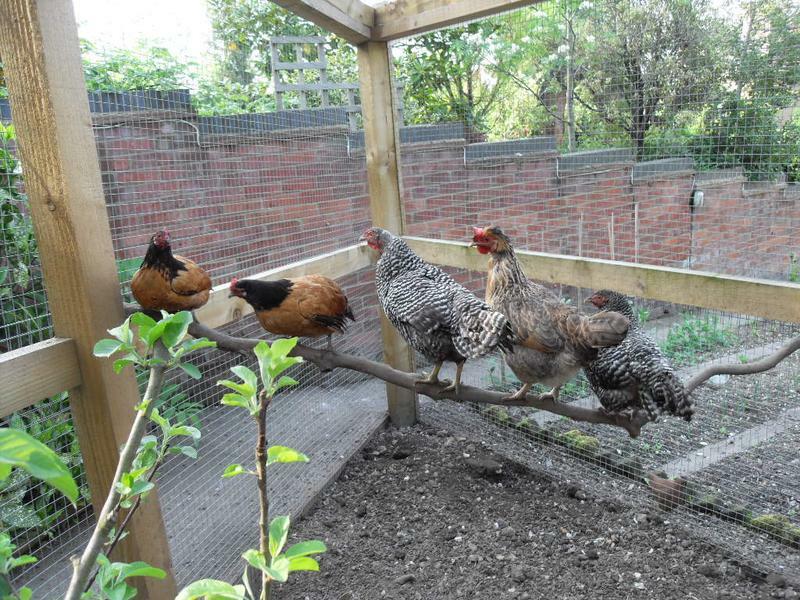 I don’t think it will do them any harm and if they were in a free range environment they would have access to branches which they could peck at. I think they just enjoy this. It’s odd though that it is something just the little girls do. I haven’t ever seen the three bigger girls do this. I wonder if any one else has seen their girls do this? Maybe it is just something to keep them occupied. Maybe, they do look as if they enjoy it. Sometimes one little girl will start and then another couple will spot her and run over and join in. Sometimes all the amigos will be gathered around pecking at it. It seems to be just the amigos that do this. Mine have an old garden bench in their run and they have almost totally pecked through the oldest bits of wood which I assume they’ve eaten. 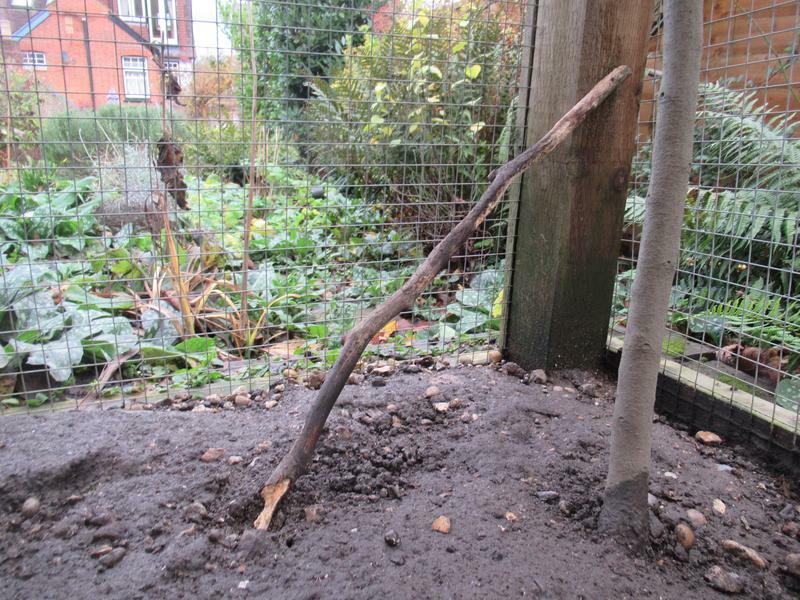 There is also a tree in their outdoor bit that we call the peck tree because they’re always pecking at it – they never get through the bark so I don’t know what that’s about! It’s good to know it’s not just my girls. I think they just enjoy pecking. The amigos seem to be more pecky then the other girls. They are always pecking at the shelters, especially the small one with the plastic sides. I assume they are pecking at specks of dust. They also peck at the metal chicken that stands just outside the run. They peck at it through the weld mesh. The shelter gives off a constant tap, tap, sound and the metal chicken a metallic ding, ding, sound. My husband wondered if they like the sound or if they were strengthening their beaks but I think they just like pecking.